CHAPTER 1: THE SUPERNATURAL 70s. In the 1970s, and especially in California—the youth were being exposed to various kinds of occultism, often with drugs as an aide. To children of dysfunctional families, the occult had a special appeal: a way to escape from the problems of this world. New Age theosophy (Edgar Cayce), Satanism (Anton LaVey), and the Jesus Movement (Chuck Smith), were three of the dominant movements at the time, for young spiritual seekers. Some people who dabbled heavily with drugs and the occult became mentally ill. To Charismatic Christians or Jesus Freaks, who have been baptized in the Holy Spirit with tongues, visions, dreams, voices, and the presence of God:–the story of Elijah versus the false prophets of Baal (1 Kings 18), has been a reminder of their own combat with the New Age Movement and the occult in our generation. Oh, how deliverance ministry is needed! This Elijah paradigm has probably been influenced by John and Paula Sandford’s The Elijah Task (1977). CHAPTER 2: PSYCHICS VS. PROPHETS. We’re living in a time, when many young people, coming from broken families, are turning to the supernatural for a sense of security and control over their lives; but there are also those who just want to be entertained by the supernatural. Because New Age occultism is the most politically correct—it is the most popular, entertaining, and experienced. Psychics are by far more popular than Christian prophets—like Kansas City prophets Mike Bickle (Growing in the Prophetic) or James Goll (The Seer). Both psychics and prophets experience supernatural dreams, visions, voices, and healings—but THE GOSPEL is what makes the difference. Prophets accept the Gospel; psychics reject it. Moses (Exod. 7-10), Elijah (1 Kings 18), and Philip, Peter, and John (Acts 8:9-25) are Biblical examples of God’s prophets gaining victories of power over psychics. God’s power increases by worship, obedience to the moral law, and holy love. CHAPTER 3: THE NEW AGE MOVEMENT. There are many Christians who are naïve about the unlawful occult practices condemned by Scripture. Either out of curiosity, a desire to be entertained, or being deceived—many go see fortunetellers, consult horoscopes, etc. Little do they know, but often psychics were abused in some way earlier in life, and started receiving demonic revelations from “spirit guides.” The New Age Movement gained popularity through psychic Helena Blavatsky in the 1870s. It was through psychic feats, or occult magic as stage entertainment, in New York. After gaining a following, she established the Theosophical Society—and moved to India. In the 1880s, secular parapsychology was developed by William James, Carl Jung, and Sigmund Freud—all members of the American Society for Psychical Research. While these men admitted to the existence of some “paranormal phenomena”—they saw such things as originating in man’s natural human faculties; and not coming from spirits or supernatural sources. It is wrong that Christians like Watchman Nee (The Latent Power of the Soul) are at liberty to believe in the existence of a latent natural psychic power. I personally reject the doctrine completely as coming from the occult, as do Clifford Wilson and John Weldon (Occult Shock and Psychic Forces, Ch. 18). Also, necromancy is forbidden, but sometimes God sends departed saints to bring messages of revelation. Also, a curious interest in the occult can lead to demonic oppression and deception. CHAPTER 4: TRUE PROPHETS. Nostradamus, Edgar Cayce, and Jeane Dixon all claimed to be Christians; however, they were all lured into a world of visions with occultic or astrological theologies, usually involving “ghost contact” or spiritism (necromancy)—hence they were psychics or false prophets. TRUE PROPHETS are those who do not depart from orthodox theology (I say, Reformed or Wesleyan), take a strong stance against New Age doctrines, and their lives are marked by Biblical holiness (or sanctification). Sure, they have visions, but they are all about Christ and the Gospel. To agree with Loren, I would put the following Charismatic Christian ministers into the category of true (but not perfect) Christian prophets:–Mike Bickle (Growing in the Prophetic) and John Paul Jackson (Understanding Dreams and Visions). Also, pneumatology is essential for spiritual discernment. Also, the purpose of prophets is to challenge the lukewarm; and to call men to grow in the righteousness of Christ. CHAPTER 5: PSYCHIC HEALING VS. DIVINE HEALING. There are two healing movements in America right now. One is demonic, psychic, and New Age; the other is divine, prophetic, and Christian. Both use forms of prayer and the laying on of hands—but THE DIFFERENCE IS THEOLOGY. The psychic healers promote theosophy doctrines; whereas, divine healers come from a Christ-centered, Gospel-centered approach. [Andrew Murray’s Divine Healing; A. J. Gordon’s The Ministry of Healing; A. B. Simpson’s The Gospel of Healing—these are considered the classics on divine healing, and represent Dutch Reformed, Baptist, and Presbyterian or Christian and Missionary Alliance views—all of which could be categorized as some form of Charismatic but “Reformed theology.”] Prayer, fasting, and consistently seeking the presence of God is said to be the way to increase faith for healing prayer (Jas. 5:14-16). While it is unfortunate that “positive confession” teachings have influenced practitioners of divine healing—they still should be praised for seeking higher levels of faith (unlike liberal Christians and Cessationists). While there are many “faith healers” who are ungodly charlatans, there are few with real healing power in prayer—and who exhibit a godly life: Murray, Gordon, Simpson (aforementioned), John G. Lake (On Healing), John Wimber (Power Healing), and Randy Clark (The Complete Guide to Healing). CHAPTER 6: MARKS OF A FALSE PROPHET. In the Pentecostal and Charismatic churches, it’s important to practice spiritual discernment, about true prophets and false prophets. Just as the prophet Elijah confronted the false prophets of Baal (1 Kings 18), so we must confront false prophets in the Pentecostal and Charismatic churches. They are known by their greed, fornication, and occultism, whether in spirit or in literal terms (p. 117); they are ungodly, proud, foolish, and glorify self (pp. 122-123); often, they make up imaginary visions out of their own minds (visualizations), instead of receiving spontaneous and revelatory visions (p. 125); they may often fall into delusions unchecked by church tradition, godly accountability, and orthodox theology (I say, Reformed or Wesleyan) (pp. 126-127). Also, there are demonic words of knowledge from a spirit of divination (Acts 16:16-18):–which can be discerned by observing the prophet does not glorify Jesus (John 16:13-14; Rev. 19:10). CHAPTER 7: PROPHETIC EVANGELISM. We are living in times when America and Europe are filled with New Age psychics. Demonic signs and wonders are increasing; and Christians need to respond with prophetic evangelism (see Sean Smith’s Prophetic Evangelism). Just as Elijah and his prophets shut down the psychics of Baal, so should we! Of course, not with violence, but with THE GOSPEL OF JESUS CHRIST. There are two places for prophetic evangelism: (1) “prophetic booths” at psychic fairs and (2) the city streets. In my opinion, Patricia King has the most integrity in this arena—she believes “words of knowledge” should be used while witnessing on the streets. However, other “prophetic evangelists”, like Doug Addison, will set up prophetic booths at New Age psychic events, and not even say the name of Jesus, but just speak of “the Creator” and His love. (I believe that is wrong. To me, this is shying away from preaching repentance from sin, faith in the cross, and obedience to Christ, and is, in effect being ashamed of the Gospel). I say, the evangelistic standards of George Whitefield and John Wesley cannot be forgotten: OPEN AIR GOSPEL PREACHING…but I like Smith and King’s additional element: prophetic evangelism, or using words of knowledge while preaching the Gospel. CHAPTER 8: SIGNS, WONDERS, AND MIRACLES. Nature miracles are happening in the meetings and lives of those involved in the prophetic movement. Rain miracles; and manifestations of glory clouds, gold dust, gold fillings, angels, throne room encounters, etc. This may or may not happen during a healing crusade, or while a prophet, or healing evangelist is speaking. In the midst of healings, words of knowledge, and the manifest presence of God, sometimes angel feathers will appear, and even gems. These things accompany the lives of Christians who regularly hear God’s voice, have trances, dreams, visions, or angelic visitations. Much more rarely, some prophets experience nature miracles of teleportation, walking through walls, dematerialization to pass through a harmful crowd, walking on water, and raising the dead—just like Jesus. But there will be scoffers (Cessationists) who dismiss these miracles as demonic (occult) or charlatan. But to those who have faith, first-hand experience of these things says differently. CHAPTER 9: MARKS OF A TRUE PROPHET. Derek Prince, Randy Clark, Mahesh Chavda, and other godly healing evangelists teach that you must be willing to (1) seek God’s presence, and (2) embrace “your personal cross” of Christian suffering, if you are going to seek the prophetic and healing power of God. “Lying signs and wonders,” the kind the Antichrist will have, always justify carnality and unrighteousness (2 Thess. 2:9-12). BEWARE OF CARNAL CHARISMATIC HEALING EVANGELISTS. Godliness and self-denial are marks of the true anointing (and true prophets). CHAPTER 10: BUILDING ON THE SHOULDERS OF PAST REVIVALISTS. Just like Jesus, we too as Christians have to be BAPTIZED IN THE HOLY SPIRIT, if we want to work miracles. If we want to grow in the power of God, then we need to honor the revivalists of the past, who paved the way of Pentecostal and Charismatic Christianity (e.g., John G. Lake and Smith Wigglesworth). We cannot progress unless we build on their shoulders, theologically. After arriving at an understanding of good CHARISMATIC THEOLOGY—we need to PRAY FOR THE MIRACULOUS GIFTS to come upon us until they do; and be willing to obey any direct words from God. CHAPTER 11: MAHESH CHAVDA ON WORKING MIRACLES. Mahesh Chavda is a healing evangelist who has moved in levels of power like the prophet Elijah! He casts out demons, heals the “incurably” sick, and has even CALLED DOWN FIRE FROM HEAVEN on a sorcery tree in Kananga, Zaire! One time during a tent meeting, the Holy Spirit visibly appeared as a glory cloud glittering with gold. (He definitely sounds on par with a Catholic saint, like Vincent Ferrer.) At the time of working a miracle, he says a simple “PRAYER OF COMMAND” (p. 199). But the key to his faith and power are “LONG SEASONS OF PRAYER AND FASTING” (p. 198). Chavda’s key to miracle working is: God “has called us to FAST and PRAY, and then to OBEY” (p. 201). I recommend his books: The Hidden Power of Prayer and Fasting and The Hidden Power of Healing Prayer. 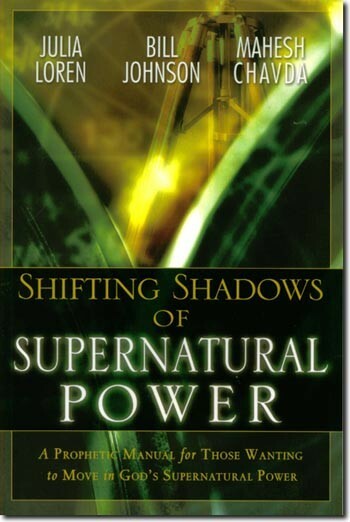 Julia Loren’s Shifting Shadows of Supernatural Power (2006) was an exceptional piece when it first came out. It was a journalist’s review of various highlights of the prophetic movement. Seven years later (2013), it is still a very relevant book. Whatever supernatural teachings have been communicated through this movement, Loren has pretty much highlighted and summarized (a more thorough study would be Bill Jackson’s The Quest for the Radical Middle: A History of the Vineyard). The following books, based largely on my study of the prophetic movement, and of her highlights, would serve as a functioning “mystical theology” or “prophetic theology.” The only things I would add to make things more prophetically accurate and godly, is to include some gleaned insights from Catholic mystical theology (e.g., Augustin Poulain’s The Graces of Interior Prayer or Albert Farges’ Mystical Phenomena) and Reformed or Wesleyan soteriology (e.g., Kenneth Collins’ Wesley on Salvation or John Gerstner’s Jonathan Edwards: A Mini-Theology). (Provided with a strong warning against John Crowder, who in his New Mystics and The Ecstasy of Loving God, has adopted Catholic mystical theology, but also Thomas Merton, some New Age books, and a latent universalism.) Classical revival theology would make up for what I see to be a lack of historical theology, or prophetic tradition, or classical revivalism that the prophetic movement seems all too naïve about (but Chapter 10 addresses this). This can serve to check heresy and increase salvations and miracles, especially if the soteriology remains mostly Wesleyan or Arminian (usually Continuationists or somewhat charismatic). Nevertheless, Edwards and the Puritans need to be valued for their Reformed soteriology on Hell, the Atonement, and sanctification, among other things (but they are often Cessationists). If we are trying to “preach the Gospel with signs following” (Mark 16:15, 20), then it follows that we should not only have our theology of the Holy Spirit in order (pneumatology, spiritual gifts), but also our theology of salvation (soteriology, the order of salvation). We should preach the order of salvation with spiritual gifts following; preach soteriology with charismatic pneumatology following. Jackson, John Paul. Understanding Dreams and Visions. 6 DVD set. King, Patricia. Spiritual Revolution. Prophetic evangelist; has shown ethical direction since Todd Bentley’s downfall. Sandford, John and Paula. The Elijah Task. Brief reference to Kenneth Hagin’s vision, but also refers to David Wilkerson’s vision. Sandford, John. Elijah Among Us. Musings of a seasoned, experienced prophet. Sandford, R. Loren. Understanding Prophetic People. Morally critical but involved in the prophetic movement; however, involved in the Toronto Blessing (eh?). Son of John and Paula Sandford. Vallotton, Kris. Basic Training for the Prophetic Ministry. From Bethel Church—The School of Supernatural Ministry. Has preached on sexual purity. Wilson, Clifford, and John Weldon. Occult Shock and Psychic Forces. For discerning the occult. Chavda, Mahesh. The Hidden Power of Prayer and Fasting. —–. The Hidden Power of Healing Prayer. Clark, Randy. The Complete Guide to Healing. Gordon, A. J. The Ministry of Healing. Lake, John G. John G. Lake on Healing. Simpson, A. B. The Gospel of Healing. Wigglesworth, Smith. Smith Wigglesworth on Healing.